KATHMANDU, Dec 05: Thai airways took its first flight in Nepal on December 4, 1968. Thai Airways International Public Company Limited hosted a function to celebrate the completion of its 50 years of operation in Nepal. Thai Airways was also the first to operate a passenger jet flight which made Nepal known to most other parts of the world. Initially scheduled for weekly flights, Thai gradually increased the number of the flights due to high public demands. In October ‘97, Thai A300, 800 planes were in operation while the B 777 200 planes were operated in support and occasion of the Visit Nepal Year in November, 1998. The B 777 200 ships are in operation presently as well. 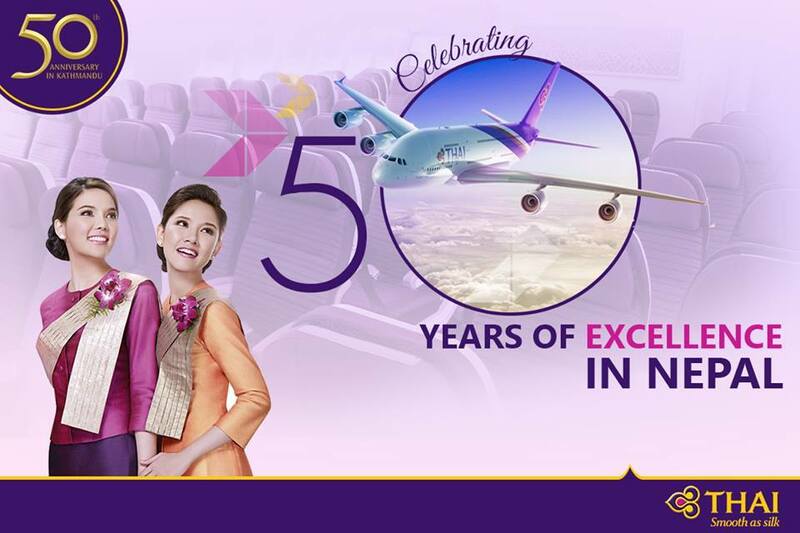 Thai Airways has achieved historical successes in the golden 50-year journey of its operation. In November, 1985 Thai became the first in Nepal to provide services of computerized reservations and included the provision of the service to various travel agents in 1990. Thai has continued to expand its routes to various new destinations. Thai has its own Silk Class Lounge, Ground Handling Service, Royal Orchid Holiday Packages as well as its own Technical Service and has added the first In-Flight Magazine which added a new dimension to the airways. Thai has been providing CSR programs in Nepal and annually on July 31 it organizes Blood Donation Programs, Cataracts Surgery Camps, Cardio Check-ups and Health Camps along with stationery donations to orphans. Thai has awarded commendation letter to the Royal Thai Embassy in Nepal, the Nepal Civil Aviation Authority, Tribhuvan International Airport Authority, Nabil Bank Ltd and Hotel Annapurna. Thai has also been providing its services to the Top 3 contestants of the Miss Nepal pageant.